Imagine you have a colleague who’s missed a deadline or failed to stay on budget. You decide to say something by bringing your best crucial conversations skills into play. You stick to the facts while avoiding hasty and unflattering conclusions. Not a bad start. But the other person doesn’t quickly comply. Instead, he makes excuses. Would you or the people you work with know what to do next in a manner that not only solves the problem but also improves the relationship? This workshop builds on the skills learned in Crucial Conversations and introduces a powerful set of new skills to resolve your most challenging accountability issues. It enables those who already have knowledge of crucial conversations skills to diagnose why someone keeps falling short of set expectations and then derive a plan that both motivates and enables the other person to successfully change his or her behaviors. These additional skills are perfect for crucial accountability conversations that seem resistant to dialogue skills alone. 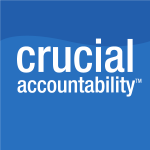 What Does the Crucial Accountability Companion Course Teach? Hold anyone accountable, regardless of position or personality. Begin any performance discussion on the right foot—avoiding defensiveness and costly arguments. Diagnose the underlying causes of misaligned or bad behavior. Motivate without using power and enable without taking over. has been disappointed by others’ performance, and wants to be able to hold them accountable in a way that’s both firm and respectful. is tired of working in an environment where goals are set and assignments are given, and then people treat their assignments as rough guidelines rather than firm commitments. is part of a work group where failed deadlines are met with hostile looks and vague comments instead of honest, direct discussion. In short, this course will benefit anyone who wants to learn how to hold others accountable, or as a leader wants to help create a culture where everyone speaks honestly, clearly, and respectfully about violated expectations. NOTE: This course is ONLY for individuals who have completed Crucial Conversations. Learn how to create an environment where employees resolve their most complex and persistent accountability issues with complete candor and respect. Utilize Crucial Accountability skills and watch the positive impact they will have on employee satisfaction and job performance. Click here to view a 3-minute video about this workshop. Click here to read chapter 1 of Crucial Accountability: Tools for Resolving Violated Expectations, Broken Commitments, and Bad Behavior.